Greetings again from the darkness. Politics in the United States is an embarrassment to any citizen who is paying attention these days. And by “these days”, I’m referring to at least a couple of generations, if not even more. The bickering between and within political parties is more closely related to playground arguments than debates among statesmen. The most effective wall being built is the one between the two sides – it’s a wall that has little to do with reason or “the greater good”, and everything to do with standing steadfast in one’s belief that an opinion is a fact that should be shared by all. Enter stage and film producer Jim Stern … a self-described political junkie. Mr. Stern grew up in a house of “Kennedy Democrats” and all but worships former President Barack Obama. 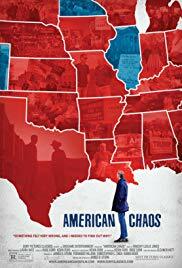 He opens his film with clips of past Presidents, dating back to Theodore Roosevelt, and states his purpose as a desire to understand how so many Americans could vote for Donald Trump. It’s an admirable mission, and Mr. Stern is to be commended as one of the few extremists (on either side) willing to listen to what the other side is saying. It’s 9 weeks after the election, and Stern is in the audience for Obama’s farewell speech. He (Stern) has tears in his eyes, as the man he so admires is being replaced by one who inspires little faith or respect. We now flashback to 6 months prior to the election. Stern paraphrases Atticus Finch from TO KILL A MOCKINGBIRD, and pledges to try and understand the other side by getting to know their point of view. His road trip takes him from Florida to Cleveland to West Virginia to Arizona. Stern’s approach is to present himself as a neutral interviewer so that folks don’t get defensive, and instead just open up about their views. He speaks to a man who is a legal immigrant from Cuba, a Midwest Pastor who is every bit as adamant in his beliefs as Stern is in his own, a conservative radio talk show host in Arizona who eloquently states her case, and folks in West Virginia who just want the coal mines back up and running so that they might escape poverty. One of the men he speaks with is part of the infamous Hatfields and McCoys feud, and he admits to voting for Obama twice – but is now convinced Trump is the best hope for rescuing the state’s economy. Stern uses the ongoing campaign as the structure for his road trip and story, and doesn’t shy away from admitting Hillary Clinton’s “basket of deplorables” speech was a turning point … as was the last minute renewing of the FBI investigation into her actions. But since we know all of that, what is most fascinating here is listening to regular folks … voters … providing insight into their viewpoints. These mid-America citizens are tired of politicians being bought and sold. Trump was saying what these people were thinking – he was reaching out to (mostly white) disaffected voters. Stern is stunned at the ovation Trump receives at the Republican convention in Cleveland. He is surrounded by tens of thousands of Americans who don’t believe what he believes. It’s a powerful moment for him and the film. “They hate her (Hillary) and they hate Obama too.” Stern is hit with the harsh reality that his idol is not idolized by all. His most accurate statement is that blue state voters and red state voters simply do not understand each other. With so many of one group clustered in California and the northeast, while the others are spread across the middle of the country, it’s really no surprise that these citizens have different views and needs. It’s also not surprising that since the “mainstream media” is equally clustered in those two geographic areas, that information distributed is skewed towards those views and issues. Abortion and gay rights appear to be non-factors in his discussions, while jobs, corruption and illegal immigration are what matter. Again, Mr. Stern is to be commended for letting these citizens speak their mind. It’s a nice contrast to another high profile documentarian renowned for editing to prove his own well-publicized views. Stern’s brother was a key negotiator in the Paris Accord, so he certainly has a personal stake in the drastic political change. In fact, we often see his true emotions despite his ability to remain impartial to those speaking on camera. Election night with violin music is a bit too much, but for the most part, Jim Stern and Atticus Finch work together here to enlighten the “other” side.